Rockstar Games' detective adventure, L.A. Noire is due to hit the PlayStation 3 and Xbox 360 next spring after a very long wait. Four fresh shots of the 1940s investigative adventure are here to make that wait seem ever longer. For impressions of L.A. Noire in words, not so much pictures, read our most recent eyes-on preview of the game. 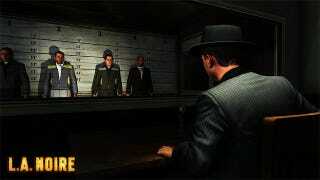 If you haven't already seen the dozen or so shots of L.A. Noire in that post, hey, even more new (to you) screen shots!